After the awards given out each year we do the accounting and administration followed by the making of the ‘making of BusHo’ and collecting all media presence with all the information to be put in our reference book that helps us to gain some support for next year’s festival on different tenders. First on Media Program Festivals in Brussels at the end of October. Please welcome this little gift from us with our report, catalogue and reference booklet. It was a mission to catch those students having their holiday at lake Balaton during summer but eventually we succeed and we could carry on our flourishing partnershift with our Bulgarian friends. In previous years we attended In The Palace festival in Balchik several times then last year we’ve delegated two Hungarian bands to a music camp, and this time 8 lucky students could take part on a multicultural workshop there, called Contemporary Art Zone. It seems to be worth of set off to this adventure, so the feedbacks and pictures say, we would like to congratulate to all to represent Hungary in this international workshop. This is the end of the 7th BuSho International Short Film Festival. Out of 962 entries, this year’s pre-jury selected 93 movies in the competition program which were watched by the National Student Jury and the international jury together with the audience. The members of the international jury were: Djinn Carrénard, young filmmaker from France, Riina Mikkonen, organiser of the Tampere Film Festival, Miomir Rajcevic, director of the Belgrade Media Centre, Kocsis Ágnes director and Wolfgang Leis marketing expert. Besides the beautiful statues created by Solide Art Ltd. this time again awards were offered by Hungarian Filmunio, Kodak, the National Digital Data Archive, the Soltész Advertising Agency and Extreme Digital. Firstly, the members of the National Student Jury (Tóháti Zsuzsa, Vargha Márk Péter, Nemes-Jeles Veronika) went on stage and explained their decision. The organisers, having thanked for the students’ work, went on to the international jury awards which were handed over in the name of the jury by Wolfgang Leisto the filmmakers present at the ceremony. To everyone’s great pleasure, the awarded arrived in a row to take over the prizes. Before the announcement of the main awards of the 7th BuSho, Miomir Rajcevic, member of the international jury resumed the jury’s evaluation. He told the audience that they had seen a high quality programme at a well organised festival, however he emphasised that one thing had been missing: unfortunately, the participation of the Hungarian filmmakers in competition was again very low. After the awarding ceremony, all the prize-winning movies were screened, while the organisers and the jury members gave interviews. 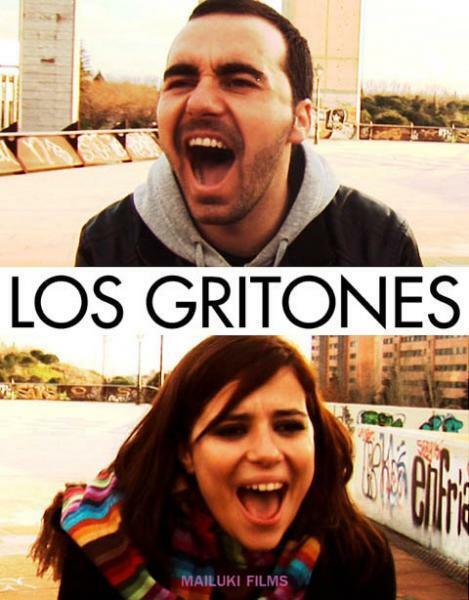 Kocsis Ágnes said the following:"In the past 10 years, the technical standard of short films has rocketed. Apparently more and more filmmakers make shorts. However, it also means that more and more young directors are involved in the genre, and so the stories are less thought over. Of course, there were outstanding, almost perfect movies as well in the programme. The freedom of an artist does not necessarily mean the freedom of thought, because what he invents has to be realised as well. And for this, money is inevitable!" Thanks to all the co-operators and the Motion Picture Art Department of the Ministry of National Resources for its support. See you in 2012 at the 8th BuSho festival! List of the winners here. 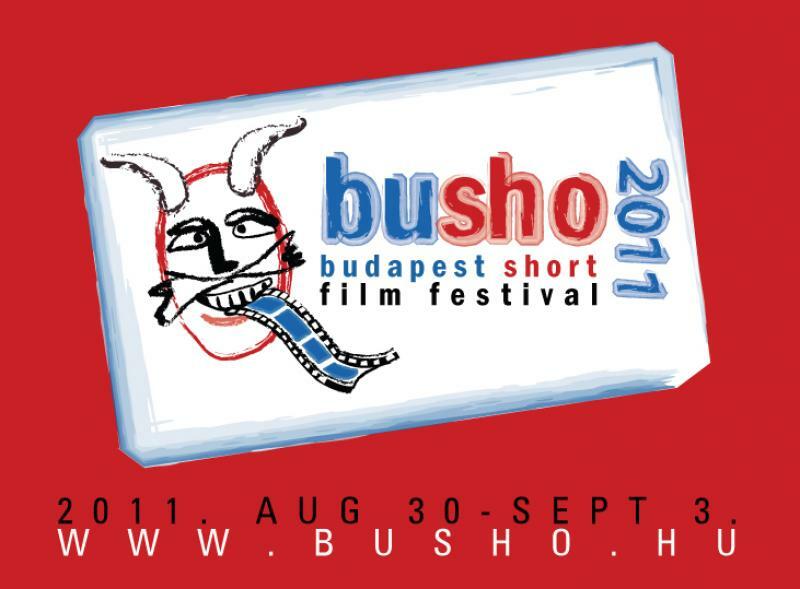 The 7th edition of BuSho (Budapest Short) International Short Film Festival is to take place between 30 August and 3 September again in Vörösmarty cinema, and presents a competition programme full of international stars, a panorama section, a best of the partner festivals, and for the first time in Hungary, the short film nominees of the European Film Academy. Following the selection of films, we recruited the members of the international jury which is again composed of excellent cinema experts:young French film director Djinn Carrénard; Riina Mikkonen, organiser of Tampere Film Festival; Miomir Rajcevic, director of the Belgrade Youth Media Centre; the Hungarian representative to our greatest pleasure this year is Ágnes Kocsis film director; and, as the „5th element at the Seventh”, the only standard member and coordinator of the BuSho jury, Wolfgang Leis, marketing expert. This year, as usual, the National Student Jury is going to be present and will be expecting you with “the big” at the evening public jury consultation which means the intellectual climax of the festival each year. The great attraction of this edition is the outcome of a long process: by mere coincidence, it was the BuSho organisers who brought back home the European Film Award nomination from Drama, Greece to Bálint Szimler for his film I’m Here! Although it didn’t win in the final last December, the BuSho organisers were curious to know which films were the concurrent nominees. 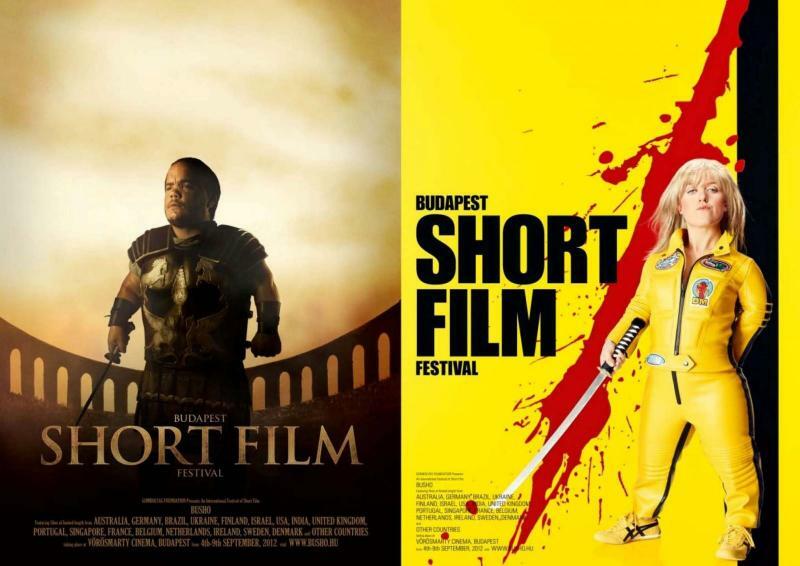 As a result of a long correspondence, we received the authorisation to present these movies – and BuSho has become the first Hungarian festival to show the nominees of the short film category of the European Film Academy 2010! Apart from the Competition section, we present the Panorama section, the best of the partner festivals, as well as evening concerts in Trafik, “Kultúrdiszkó”, and an international volunteer forum. 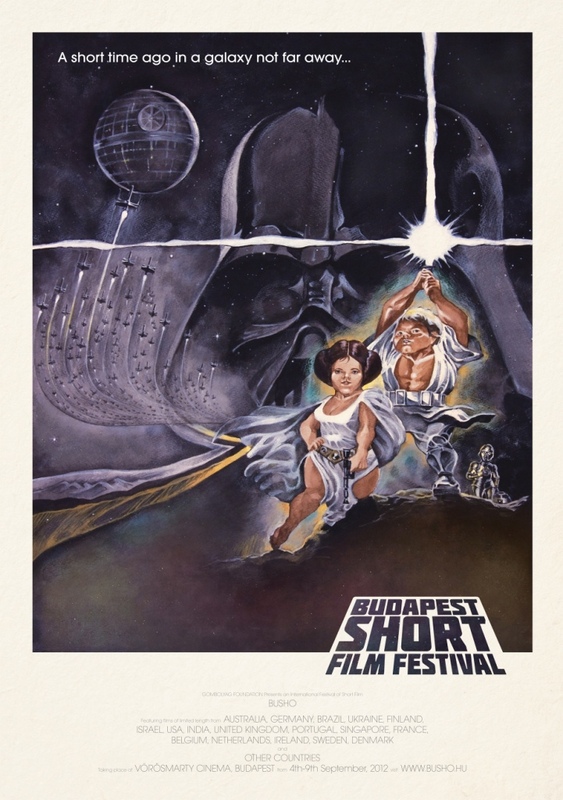 Parallel to the Budapest based central spot, there are screenings in the countryside (Szolnok, Szombathely) and across the border (Nagyvárad, Magyarkanizsa). And this year for the first time, as a rather symbolic financial contribution, a new ticket system has been introduced exclusively at the Budapest spot and only for the competition blocks mainly for statistic and strategic reasons. May all festival visitors be welcome at the event which starts on August 30 Tuesday evening at 19:00 with the opening ceremony and finishes on September 3 on Saturday at 19:00 with the awarding ceremony. The detailed screening programme was finalised simultaneously with the accreditation deadline. This year as usual, numerous international guests have indicated their willingness to participate in the festival and the organisers trust that Hungarian filmmakers will also join the event in great numbers. 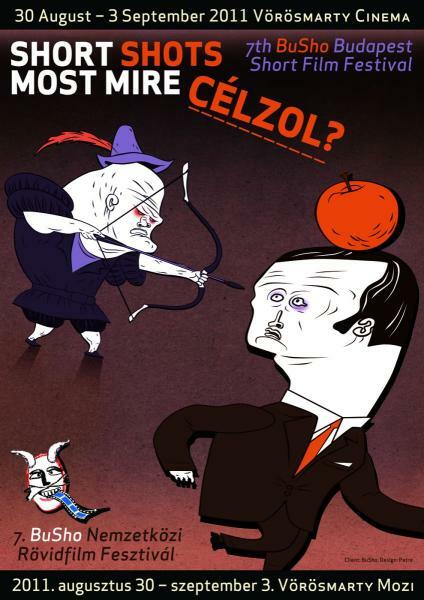 Among others, such eminent figures can be seen on screen as Jean Reno (The Philosopher), Djoko Rosic (Along the wire), or Ferenc Elek (Finale); Ferenc Cakó animator’s work is competing with the internationally acclaimed Polish animation films as well as other festival successes such as Mór György Kárpáti: Forest, or the Romanian-German co-production Silent River. 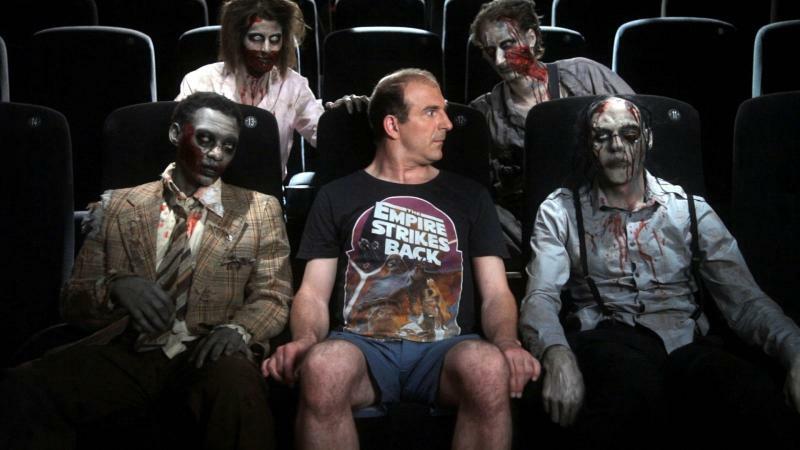 Parallel to the central event spot events, several cross-border and countryside screenings will take place, like in the Tiszap’Art cinema in Szolnok, the Savaria in Szombathely, the Szabadság theatre in Nagyvárad and the Kultúra in Magyarkanizsa. 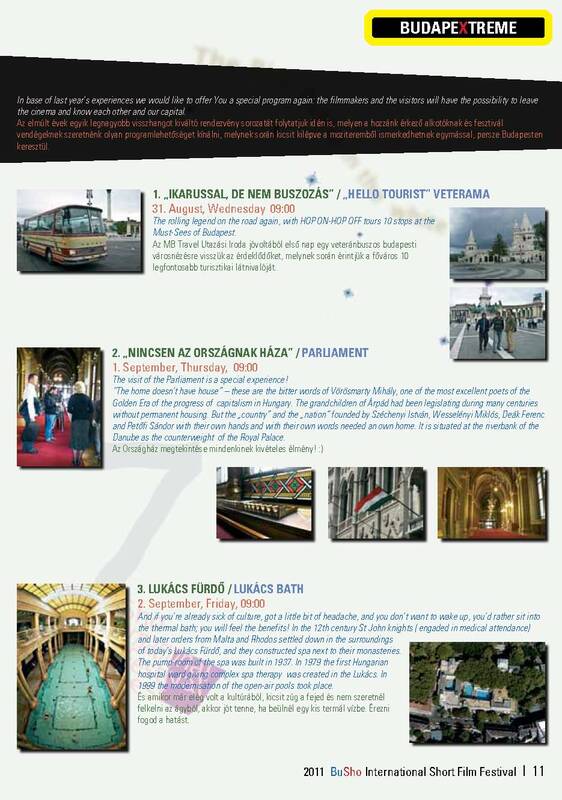 Our guests in Budapest can enjoy the morning programmes: sightseeing by the oldtimer bus, visiting the Parliament or the spas. The screenings will be followed by one of our principal attractions, the public jury consultations, where the international jury and the national student jury evaluate the films seen during the daily screenings involving the filmmakers and the audience! And of course, the rest of the usual programmes should be mentioned as well: the bestoffest screenings featuring the best shorts of the partner festivals, the evening concerts in Trafik, the Kultúrdiszkó, Volunteer forum and other surprises, sensations still under organisation; further details are going to be available before the opening on August 30. Further details, press material, illustrations, references. The pre-jury had the toughest job ever in the festival's history as they counted from 55 countries 962 entries. This amount of shortfilms is unique in Hungary. So we are pleased to announce that the 7th BuSho International Short Film Festival's competition program is lined up and contains 93 shorts in total including 65 fiction, 16 animation and 12 experimental works. By the statistics it isn't a surprise that the most entries made it to the competition are from Spain. There will be a Panorama section again where we'll show those works just missed the competition and also all the received Hungarian shorts will be screened, to make everyone an opportunity for their work to be shown. So we'd like to ask all the filmmakers to post their copy by 15. July the latest with the following technical parameters: PAL SD 16:9 (or 4:3 but please not letterbox) on MiniDV tape (SP, DVCAM) or data DVD (AVI, MOV, MPEG2 MP4). The filmmakers whose works made it to the competition can register on the website till 30th of july, if they wish to participate the festival in person. Here is a little taste from last year of what is the „BuSho experience”. Now for the next 2 months we got nothing else left to do but creating the fundamental conditions of making this festival to happen, since apart from one, all of our tenders were declined! It seems that the Board of Trustees took things seriously when deciding by considering 2011 as the year of European Volunteering, so everyone works voluntarily at the festival, although neccessary things like festival catalogue, cinema rental, jury costs or the awards have to be paid for. But we'll find a solution and all will be welcome in the first week of September at the 7th BuSho Festival! DANUBE - Europe's Blue Line - a documentary series about a cult river on the millennium. In the history of Europe crucial things had happened along the DANUBE, however Johann Strauss was either colorblind or in love when composing the Blue DANUBE as the river's source is in the Black Forrest and flows into the Black Sea. Is it really blue in between? We'll find out now.It is a new film project made in co-production by Gombolyag Foundation (also the organizer of BuSho Film Festival) and Balassi Institute in the frame of the current Hungarian EU-presidency and will be screened in the following locations: Bucharest, Balchik, Bratislava, Belgrade, Zagreb, Ljubljana and Budapest at the BuSho short film festival. The so called joy therapy will include a short prologue followed by the screening of the finalist shorts of „Are we Europeans! 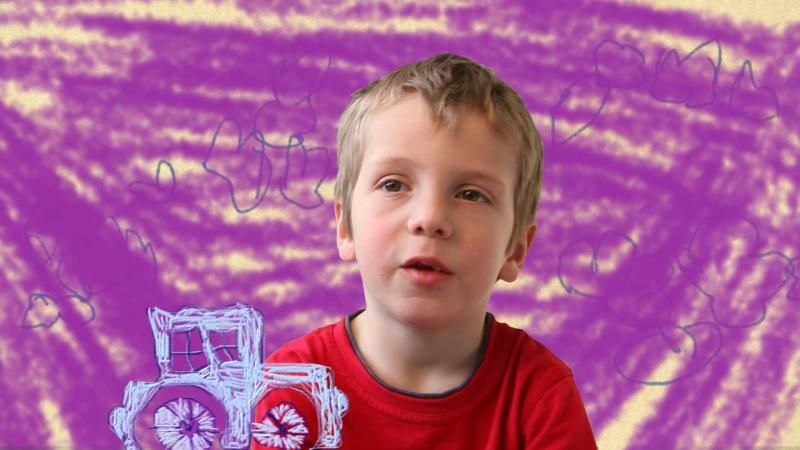 ?” and selected award winning shorts in the topic of Danube, Water, Environment. This musical video, which was made about the period when Hungary's youth was seduced by the Rock and Roll lifestyle may serve as an appetizer for our ArtCamp in GOMBOLYAG!!! 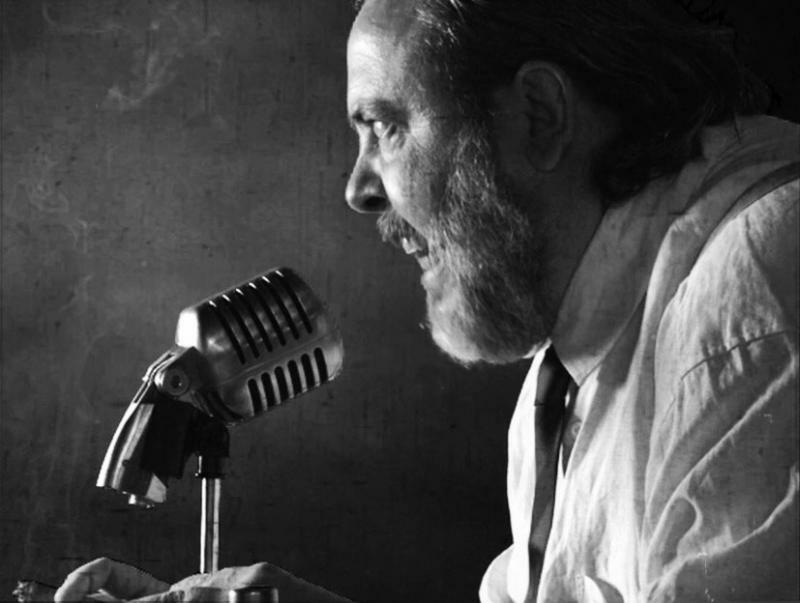 This is the end of the 2011 BuSho call for entries, which is renewed on several levels: not only you can fill in the entry form online on the website, but your film can be uploaded with one click! Naturally, we had technical problems, which have been resolved with the help of the mentha team. It is quite probable that next year this is the only way we are to accept entries for pre-selection. What’s more, this year withoutabox has also joined the “BuSho Machine” together with filmfestivals.com, so we have an astonishing number of 937 entries, more than half of which online. According to our experience so far, it will be a great deal of work from an administrational as well as technical point of view, not to mention the challenge that the pre-jury has to face – but we are happy to get down to work! We would like to ask the filmmakers’ patience as it is possible that we won’t have the final competition programme by mid-June as promised, but the results will be published by June 30th the latest. This means that the filmmakers selected can send their accreditation by July 30 and one month later, on August 30. the 7th BuSho International Short Film Festival can start! A few statistic data: Out of 937 entries 389 arrived via withoutabox, and 548 directly to BuSho, with 113 uploaded on the entry site and including 132 animation, 194 experimental, and more than 600 fiction. As to the categorisation by countries, the first place is occupied by the USA (undoubtedly thanks to withoutabox) with 145 films, the ever-winning Spanish with 109 entries, and this time 63 from Germany. To our greatest pleasure 60 Hungarian short films on the next place, followed by the UK with 54, and last but not least the French delegating 37 shorts! 60 entries were submitted for the competition 'Are we Europeans?!" The members of the jury were: János Xantus, Csaba Bollók, Géza M. Tóth, Gábor Bindics and Tamás Gábeli. Dávid Gutema won the 3rd prize (USD 400) with his animation "Blockheads". Kristóf Deák won the 2nd prize (USD 600) with his work "Honfoglalás". The main prize (USD 1000) went to Krisztina Ágói for her work "Az üveghegyen is túl"
We also congratulate for each contender! We thank for your submissions and congratulate those who will attend the LifeAD workshop in Oradea. Professional guidance was provided by János Xantus, János Szirtes, Tamás Patrovits and Zoltán Balázs. Advertising Life 2011 - WE ARE EUROPEANS!? 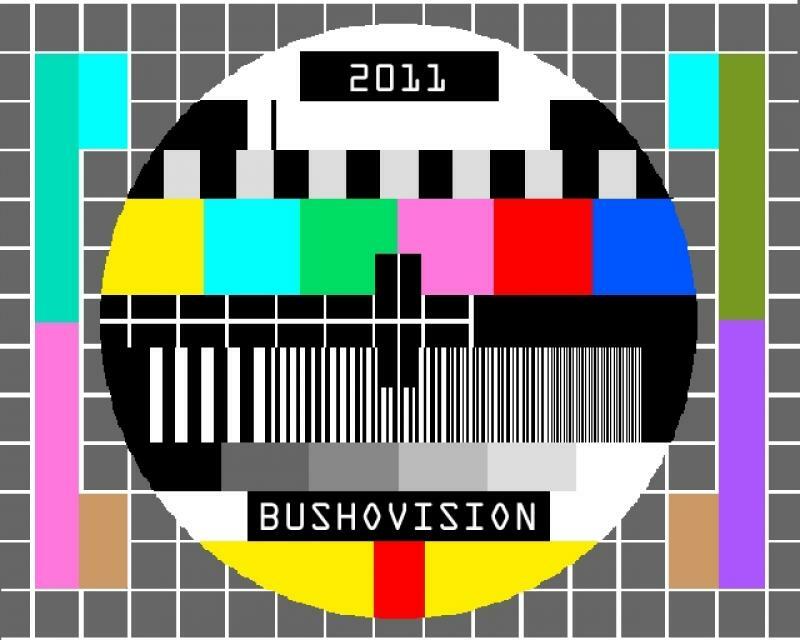 Just like in previous years the registration for BuSho 2011 will open before Christmas and this the 7th time it is 20-December again with minor but important changes. You can still enter your fiction, animation or experimental film for free that is no longer than 30 minutes and was made after 1. January 2008. Beside the previous technical updates the biggest change is that you can not only send the registration form on-line but you can also upload your film for the pre-jury to review. Those whom movies make it to the final we require a screening copy as well. Of course whoever wish to send their film by postal service they are free to do so.